The nine practice centers and monasteries listed below all practice in the Plum Village tradition and under the direct guidance of the Venerable Thich Nhat Hanh. Our centers are open throughout the year, for short or long stays, to learn the art of mindful living. Nestled on 80 peaceful acres of woodland in the southern Catskill region about two hours northwest of New York City, Blue Cliff Monastery is home to a thriving community of over thirty monastic and lay practitioners who share the art of mindful living with thousands of adults and children every year. Blue Cliff is a place to quiet the mind, look deeply, and enjoy the wonders of life within and around us through the practices of sitting meditation, walking meditation, mindful eating, deep relaxation meditation, and sharing togetherness. We invite all who wish to cultivate peace and happiness in their lives to join us for a day of mindfulness or a mindfulness retreat. Visitors are welcome year-round. Blue Cliff was formerly a family-owned summer resort, in operation since 1939. Today, the various residences have been renovated and winterized, with plans underway to add wheelchair accessible rooms and new dining and common areas. The Great Togetherness Meditation Hall was added in 2008 and can accommodate up to 800 people for meditations and teachings. This 400-acre sanctuary rests peacefully in the chaparral mountains of southern California, surrounded and protected by oaks and the natural landscape. Deer Park Monastery was established in July 2000 by the Plum Village four-fold Sangha. Now, it is a safe and serene refuge for many practitioners to come and learn the art of mindful living and to practice with a community, a Sangha. At Deer Park, the residential community of over thirty monastics and lay practitioners, live and practice together year round under the guidance of our teacher, Thich Nhat Hanh (Thây), in the tradition of engaged Buddhism, practicing mindfulness through out our everyday life. There are two hamlets: Solidity Hamlet (for monks and laymen) and Clarity Hamlet (for nuns and laywomen). The two hamlets come together several times a week to practice. The EIAB is the first Institute of Applied Buddhism founded by Thich Nhat Hanh, in 2008. The EIAB’s large campus is situated on the edge of the small town of Waldbröl, Germany, about an hour from Cologne, amid rolling fields and magnificent pine forests. The EIAB has a large residential monastic community of over 40 monks and nuns, which is very unusual for a Buddhist Institute, and provides a strong collective energy of mindfulness to support the wide range of courses on offer every year. Drawing on the wealth of the Buddha’s teaching, the European Institute of Applied Buddhism (EIAB) offers a complete program of training in concrete methods that relieve suffering and promote happiness and peace in ourselves and in the world. The training fully integrates the study of Buddhist texts with concrete applications at all levels of daily life. 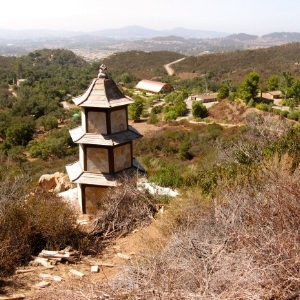 Under the direction of Zen Master Thich Nhat Hanh, together with senior Dharma Teachers in the Plum Village tradition, practitioners at the EIAB gain not only a firm grounding in essential Buddhist teachings, but a mastery of their own mind, body, speech and actions through cultivating the art of mindful living. Specifically, practitioners learn to apply Buddhist teachings in a way that helps to release tensions, and reduce stress and pain; to look deeply to understand whatever suffering that may be in them or around them; to recognize and transform painful feelings and emotions through insight; to use compassionate listening and skillful words to create understanding between individuals and also between groups in conflict; and to strengthen the inherent joy, freedom and wisdom in each person that is so essential for collective transformation. The Dharma Teachers at EIAB pass on their understanding and experience not only through words, but also more importantly, through their presence and how they go about their daily life. Practitioners at EIAB live together with the monastic community and directly profit from the collective energy of mindfulness and concentration. To be surrounded by a harmonious community is the best support for those who wish to apply mindfulness in their daily lives. Buddhism as taught at EIAB is not religion. Buddhist teachings are offered in a very practical, non-religious way, and practitioners of any – or no – religious background can benefit from learning them and putting them into practice. All programs are offered either by monastic or lay Dharma Teachers who have been selected as teachers based on their stability in the practice and ability to lead a happy life. Guest teachers who are proficient in certain subjects and the art of mindful living are from time to time invited to lead a program. EIAB courses are open to all who wish to improve the quality of their own lives and those of their families and communities. Magnolia Grove Monastery is a both a residential monastery and Mindfulness Practice Meditation Center in the tradition of Plum Village, founded by Zen Master Thich Nhat Hanh in 2005 in Batesville, Mississippi. Today, more than thirty monastics disciples of Thich Nhat Hanh are in residence. Ten years ago Magnolia Grove was little more than 120 acres purchased by a group of committed individuals and families. With hard work, dedication and coordinated effort our community created a large meditation hall with an adjoining commercial kitchen to feed participants, and built by hand a guesthouse to host 120 laypeople. Magnolia Grove Monastery is a place to practice meditation and mindfulness. It is where every breath we take reminds us of the wonders of life. A place to sit and relax. A place to walk and kiss the earth beneath our feet. It is a place to rest under a willow tree on an island in a lotus pond. A place to eat together and savor every bite. A place to listen deeply to the sounds of life and the sound of our hearts. A place to work together to build a community of love and understanding. Magnolia Grove is a place where we can stop running, and discover peace with every step we take. A place to remind each one of us that the present moment is a wonderful moment. La Maison de l’Inspir’ (a French name that can be translated as “The House of Inspiration”) is a small monastery in the Plum Village tradition in Paris, France, and the most metropolitan and “francophone” of all Plum Village practice centers. The monastery is home to several nuns, disciples of Venerable Master Thich Nhat Hanh. The house is a place of refuge, healing and rest; a place for anyone to deepen their meditation practice through the daily practice of mindfulness. It is a house of brotherhood and sisterhood where we learn every moment to live in harmony with one another in a spirit of respect and listen to the needs of the other. We are focused on the art of mindful living, to develop our deep understanding and compassion. We are happy to welcome you and share with you our mindfulness practice and our way of life. We are happy to offer humble accommodation if you wish to attend our days of mindfulness on Thursdays and Sundays. You are also welcome to attend our walking meditations and precept recitations on other days of the week. We live together, and exchange our experiences as we grow on our path of practice. The house is surrounded by a large garden, in a green region of the suburbs of Paris. At the end of our lane is the beautiful majestic river Marne, along whose banks we enjoy walking meditation every day. Plum Village, near Bordeaux in southwest France, is the largest international practice center in the Plum Village tradition, and the first residential community to be founded by Thich Nhat Hanh in the West. Plum Village is where Thay developed his dream of building a Beloved Community: creating a healthy, nourishing environment where people could learn the art of living in harmony with one another and with the Earth. What began in 1982 as a small, rustic farmstead, has today grown into Europe’s largest Buddhist monastery, with over 200 resident monks and nuns, living and practising in four different hamlets spread out across the French countryside. At Plum Village we weave mindfulness into all our daily activities, training ourselves to be mindful throughout the day: while eating, walking, working, or enjoying a cup of tea together. Plum Village is a home away from home, and a beautiful, nourishing, simple environment in which to cultivate the mind of awakening. We enjoy periods of silence, sitting meditation, rest, relaxation, mindful work and play. All practitioners who come to Plum Village are invited to join in our communal activities, whether it is preparing meals, cleaning around the hamlet, or washing dishes, as a way of learning to cultivate joy and mindfulness whatever we are doing. Every year, Plum Village welcomes thousands of meditation practitioners from all around the world who come to experience the art of mindful communal living. Over 40 nationalities are often represented at the festive four-week annual Summer Opening Retreat which offers special programs for children and teenagers. In addition to Spring and Autumn retreat seasons, where visitors are welcome to stay for a week or more, Plum Village also offers special mindfulness retreats for French speakers, teachers, and young people. The annual 3-month Winter Retreat, which is open to lay people as well as monastics, attracts hundreds of practitioners who come to deepen their practice of mindfulness and live simply and harmoniously in community for ninety consecutive days. Plum Village has an internship program for youth service, and recently opened an organic “Happy Farm,” where year-long resident farmers combine ecology and mindfulness as they cultivate vegetables for the community’s vegan meals. When he is not travelling, Thich Nhat Hanh lives at Plum Village, where he writes, teaches, gardens and guides his global community. Many of the trails around the hills and fields of Plum Village have become legendary paths of walking meditation for Thich Nhat Hanh and his community. Nhap Luu – Stream Entering Meditation Center was established on February 1, 2010, in the beautiful outback near Beaufort, just two hours west of Melbourne. Five monastic disciples of Thich Nhat Hanh, together with the support of many lay sanghas in Australia, founded the community at Nhap Luu and held the first monastic Rains Retreat there in May 2010. Since then the community has grown, and the monastery’s now extends to 55 hectares of bush, securing Nhap Luu’s future as a tranquil and peaceful place for years to come. We are very lucky to enjoy the presence of kangaroos on and around our land. All people of all nationalities and all faiths and beliefs are welcome to visit Nhap Luu. We never ask anyone to abandon their traditions and practices. We are simply here to share our learning about the wonderful benefits of mindfulness meditation and the insights offered by our teacher Thich Nhat Hanh and Shakyamuni Buddha. Nobody needs become a Buddhist to participate with us. The sisters host Days of Mindfulness every Sunday at the monastery, and joyful “working bee” community days, to which all are welcome. We also host mindfulness events in nearby Collingwood town, and larger retreats throughout the year, both at Nhap Luu and beyond. Please see the Nhap Luu website for more details. The home of Plum Village in Hong Kong is the Lotus Pond Temple on spectacular Lantau Island, where over a dozen monks and nuns, all disciples of Thich Nhat Hanh, live, practice and lead retreats in the Plum Village tradition. It is here, on this mountainous and misty island, that the Asian Institute of Applied Buddhism (AIAB) has been established and serves the Asian region. In 2010 Thich Nhat Hanh proposed that an Applied Buddhism Institute be established in Asia, to help bring the applied and relevant aspects of Buddhism to the people of Asia, and in Spring 2011 his dream became a reality. The AIAB promotes the teachings and the practices of Buddhism that help people to get in touch with the peace and joy within themselves, to dwell in the present moment, to heal and to transform suffering. This can be done through the practice of mindfulness – with our mindful breaths and mindful steps – as we get in touch with the miracles of life. The AIAB is a center of Applied Buddhism Studies and Practices, with a resident monastic Sangha as the core element offering the teachings and leading the practices. The AIAB trains monastic and lay Dharma Teachers to help meet the growing demand for mindfulness practices in Hong Kong, in Asia and in other parts of the world. The AIAB holds retreats for young people and professionals in the field of education, social work, health care, business and so on, to help them rest, to release tensions in body and mind, to deal with stress and other obstacles in life, and to reconcile difficulties in personal, family and professional relationships. Everyone is welcome to join us for Days of Mindfulness on the island, and other events “downtown”, as well as for longer retreats held on the island or in other locations. Please see the AIAB website for more details. Plum Village Thailand was founded in 2008, and in 2013 the monastic community moved to a stunning new campus on the edge of Khao Yai National Park, a UNESCO world heritage site about 240km northeast of Bangkok. Over 150 monks and nuns live in the new monastery, and the community welcomes guests for retreat stays of a week or more throughout the year. The daily program is very similar to those in Plum Village monasteries around the world, except that the tropical environment favours sitting meditation outdoors and a fresh early morning walking meditation at 5.30am. The monastery has been newly built along ecological lines by award-winning architects from Bangkok. Visitors will discover beautiful courtyards and buildings adapted to the natural environment, and young Bodhi trees planted by Thay himself. The new Meditation Hall and library are still under construction. Plum Village Thailand is the community’s largest hub in Asia, and, together with the Asian Institute for Applied Buddhism in Hong Kong, organises and leads retreats in the Plum Village tradition in Indonesia, Japan, Malaysia and Taiwan, as well as retreats for Vietnamese citizens in Thailand. The community also leads regular large Days of Mindfulness, open to all, in downtown Bangkok. Please contact the monastery for more information.